The other day, I was running behind for an appointment that I really wanted to take a mug of tea to. I had made my tea in a mason jar, and it was still too crazy hot to carry. Crap. I have to leave RIGHT NOW. I don’t know if you know this, but I HATE to throw things away. No, I’m not a hoarder. Just a crazy re-user, recycler, upcycler, thrift-freak. I had 3 wool socks with holes in the heels laying on the back of my couch for weeks, staring me in the face until I could find their purpose. After my recent tea/time incident, it hit me. Boom! (Nope, just kidding, I already said that). 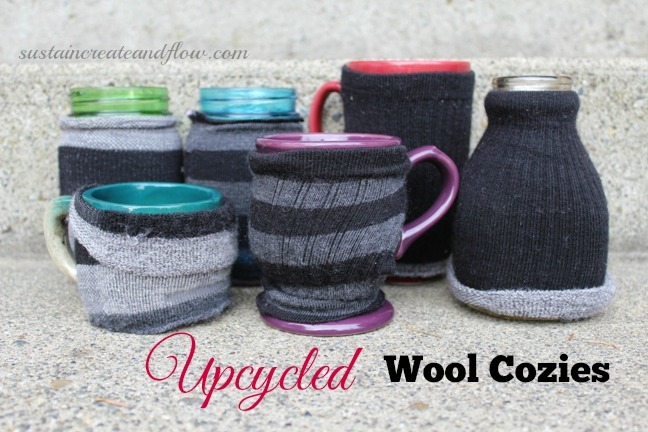 It occurred to me, that these socks with just a few snips could easily become awesome upcycled wool cozies for any mug or cup! I first made a straight cut below the ankle portion of the sock, and then another straight cut above the ankle portion of the sock, essentially cutting out the heel/ankle portion of the sock and discarding it. I was left with two tubes. Depending on where the hole in my sock was, the tubes were various sizes. Other tubes I left as is. There was no toe portion and they just slide right up a jar or glass. The last tubes I wanted to fit on a handled mug. I pressed the tube flat and made a small incision on the right side (for no reason other than that I’m right handed), and cut a small slit in the center of the tube running up and down. I left space at top and bottom of the tube to keep it intact on that side. I just wanted a small hole for the handle to slip through. So easy! No sewing. Just a few snips, and done. I love these. 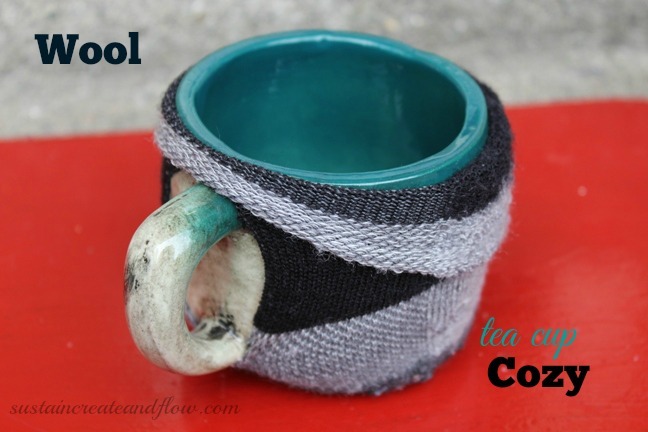 I feel like my tea cup has donned some sweet leg warmers and is headed to a yoga class. 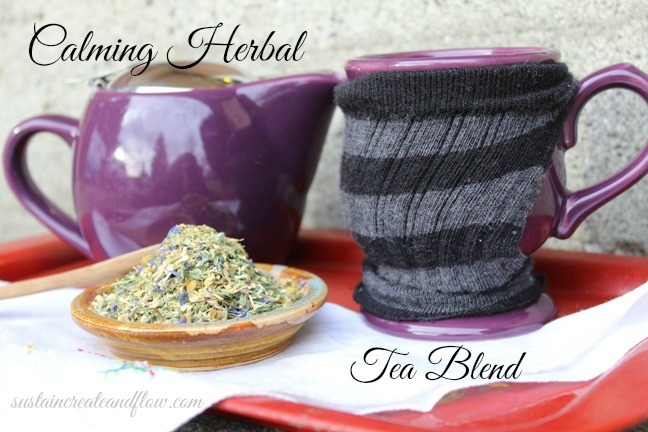 I recently published a great recipe for a Calming Herbal Tea. Click Here for something yummy to fill your cozy mug with! I purchase my herbs and herbal tea supplies through the lovely Mountain Rose Herbs. Fun! 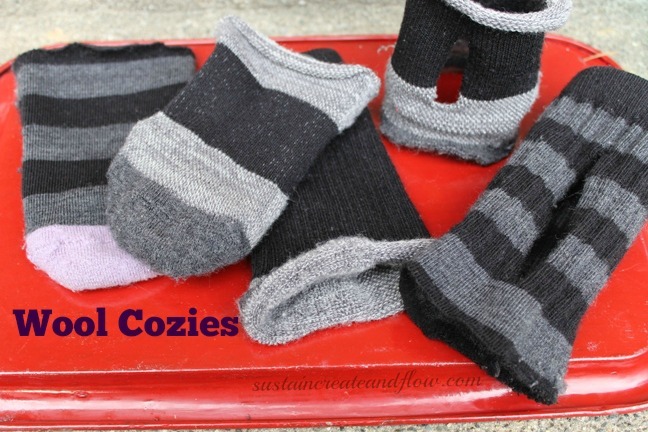 I made some with the tops of wool socks for holiday gifts in 2013. This is an even better upcycle idea.